PETERBOROUGH, ON – The Publican House Brewery has announced details of a new summer beer that will be fittingly debuted this weekend on the Summer Solstice. Our most sessionable beer is crafted with high wheat malt content and gently hopped with traditional lager hops. The result is a clean, easy drinking experience perfect for hot, hazy summer days. This “live” wheat beer has a cloudy appearance, with refreshingly crisp citrus notes. A launch party for High Noon will take place tomorrow (June 21st) from 12:00 noon to 4:00 PM at the Holiday Inn Gazebo Bar (150 George St. N., Peterborough). The $5 admission includes a pint of High Noon, and the event will feature live music by blues artist Rick Fines and a specially themed food menu. 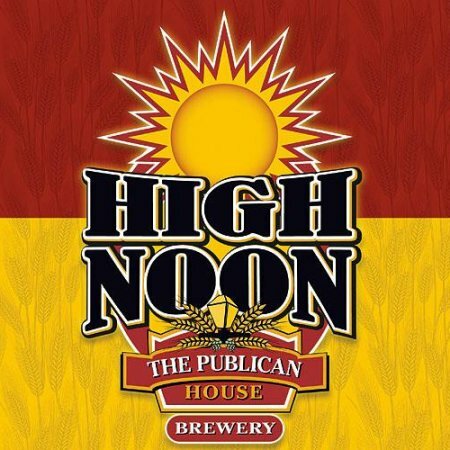 Following the launch, High Noon will be available to purchase in 473 ml cans and growlers at the Publican House retail store and tasting room in downtown Peterborough.